RRSP’s become a popular topic in February as the annual deadline approaches. With all the hype I thought it would be the perfect time to check-in and go through the ins and out of retirement savings plans and figure out if it’s worth making a contribution. Everybody knows that RRSP’s are for retirement, but it’s important to understand their advantages and disadvantages before you dump all your savings into one. There are times in your life when contributing to an RRSP is the right answer, but other times when you should look for another option. Let’s get into it and figure out if an RRSP is right for you this year. Each year you are allowed to contribute 18% of the previous years earned income, up to a maximum amount set by CRA. For 2016 that maximum was $25,370. You don’t lose your RRSP room, so if you have missed contributions from past years, you can catch-up at any time. The easiest way to check your current room is by looking at your ‘Notice of Assessment,’ it will be listed there. There are penalties to pay if you happen to go over your RRSP contribution limit. You do have a little leeway; CRA gives you a cushion of $2,000, but if you go over that then you’ll have to pay a tax of 1% per month on the excess amount. This will keep accumulating until you either withdraw the over-contribution or earn more room. Trust me, it’s a pain to fix so just don’t do it. If you contribute to a group RRSP through your employer, then those contributions also count towards your annual limit. This also applies if you are contributing to a pension plan. You will see a ‘pension adjustment’ listed on your NOA that lowers the amount you can contribute. I’ve talked about the benefits to an RRSP before (find that here) but I’ll give you a quick recap. You might think that the biggest advantage of an RRSP is the refund it can give you when you file your taxes. That’s a great perk, but you still have to pay tax when you withdraw the money down the road. The main benefit is that you can make a deposit to your RRSP when you are in a high tax bracket and then withdraw the funds in retirement when you are hopefully in a lower tax bracket. This is why it doesn’t always make sense to contribute to an RRSP, especially if your income is low at this point of your life. You’ll get the biggest advantage by contributing the most to your RRSP when you are earning at your highest level and then withdraw those funds when your income is at it’s the lowest level. Make sense? The money in your RRSP is also sheltered from tax until you take it out, so you won’t get any tax slips for earned interest or capital gains every year like for non-registered accounts. One exception to the contribute during high income and withdraw during low income rule is if you are planning to take advantage of the Home Buyer’s Plan. This is a program that allows first-time home buyers to withdraw up to $25,000 tax-free from their RRSP to help them buy a house. I like the idea of saving your down payment (at least the $25,000 of it) in your RRSP because then you can use the tax refund to get you closer to your savings goal. You do eventually have to pay the money back into your RRSP over the next 15 years (and there’s no additional refund on the repayment amounts), but I know from my own experience saving up to buy a house that every single penny counts. If you’re buying your first home with someone else you can use the HBP for each person. The refund you will get on your RRSP contribution is based on your income and marginal tax bracket. How it works is that your income for the tax year will be reduced by the amount you contribute, therefore lowering the amount of earned money you have to pay tax on. 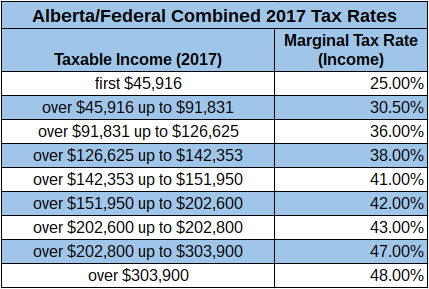 Take a look at the table below to figure out which tax bracket you fit into (these are Alberta rates but you can find other provinces here, and you’re looking for the federal/provincial combined rates). How it works is a Spousal RRSP will be opened in the lower income earners name, and the higher earner will make the contributions to the account. The higher earner will get to use the contribution on their taxes (hello refund), but then when the money is withdrawn in retirement, it will be in the name of the account holder (the lower income earner). This helps with income splitting by evening out the amount of money that ends up in each person’s name. If all contributions were deposited into the higher income earners RRSP, they could end up with a large account and have to pay more tax because of the more significant withdrawals. Taking advantage of Spousal RRSP’s and pension splitting can even out a couple’s retirement income and lower the overall tax bill they will have. The contribution room for a Spousal RRSP comes from the spouse who is making the contributions (the higher income earner), and it’s the same limit that counts for their personal RRSP. If their notice of assessment shows $16,000 it would apply to contributions into a regular old RRSP or a Spousal; they could do the full $16,000 in either or split it up between the two. One important rule to consider is the three-year attribution. You have to leave the money in the account for at least three years from the contribution date. Otherwise, the withdrawals will be charged back to the contributor’s name…defeating all purpose of the Spousal RRSP. If you are getting close to retirement (and needing the funds), you might want to halt spousal contributions and stick with your regular RRSP. One way to get around the confusion and never forget the RRSP deadline is to STOP making annual, lump-sum contributions to your RRSP. No, I don’t mean skip your contribution…I mean make it an automatic monthly (or weekly, bi-weekly, semi-monthly…whatever) payment and never have to think about it again. The only thing to remember here is that pesky little 1st of the month. If you have your automatic contribution set to run on the first, every four years that March 1st payment won’t count for the previous year. Maybe save yourself that headache and set it to run on the 15th or even the 5th. Don’t wait until February to think about RRSP’s. Breaking up your contributions throughout the year will save you stress and ensure you never miss a deadline.